Crew members on one of the simulated Mars missions this spring included Pitchayapa Jingjit (from left), Becky Parker, Elijah Espinoza and Esteban Ramirez. 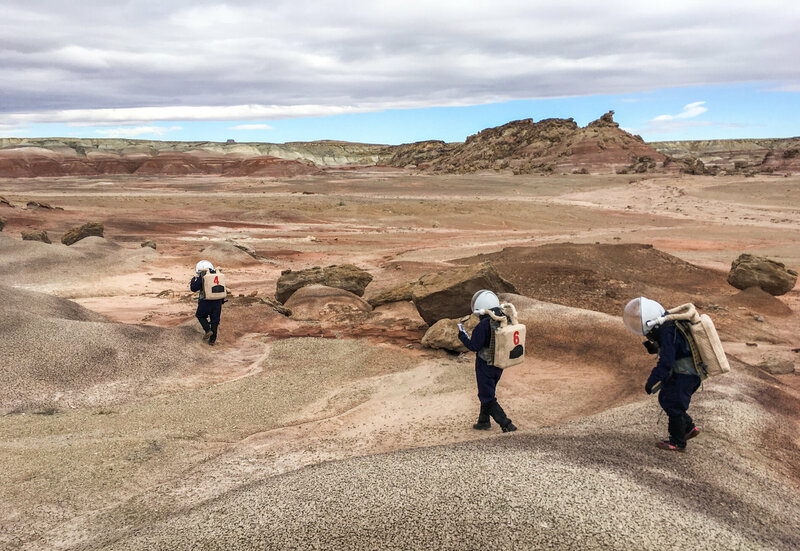 Community college students and teachers in real life, the team members spent a week in the Utah desert, partly to experience the isolation and challenges of a real trip to Mars. Victoria LaBarre was climbing out of a canyon and into a bright, vast, seemingly lifeless landscape when she started to experience an astronaut&apos;s nightmare. "Suddenly," she said, "I couldn&apos;t breathe." The symptoms were real — maybe from claustrophobia, or from exertion at high altitude. 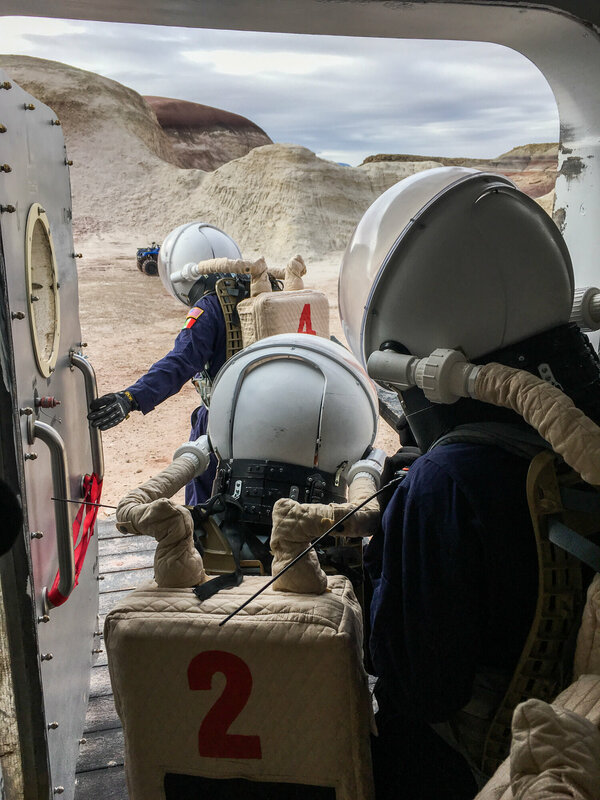 But LaBarre didn&apos;t unlatch her helmet to get a breath of fresh air because, in this simulated Mars exercise in the Utah desert, she was supposed to be an astronaut. The canyon was standing in for Candor Chasma, a 5-mile-deep gash in the Red Planet&apos;s surface. On Mars, there&apos;s no oxygen in the air — you do not take off your helmet. Elijah Espinoza, a freshman assigned to be a crew engineer and geologist for the week, heard LaBarre&apos;s call and walked her through some breathing exercises. "I think that&apos;s really one of the best things about Mars — the teamwork," said LaBarre. "I don&apos;t think you could live without it." 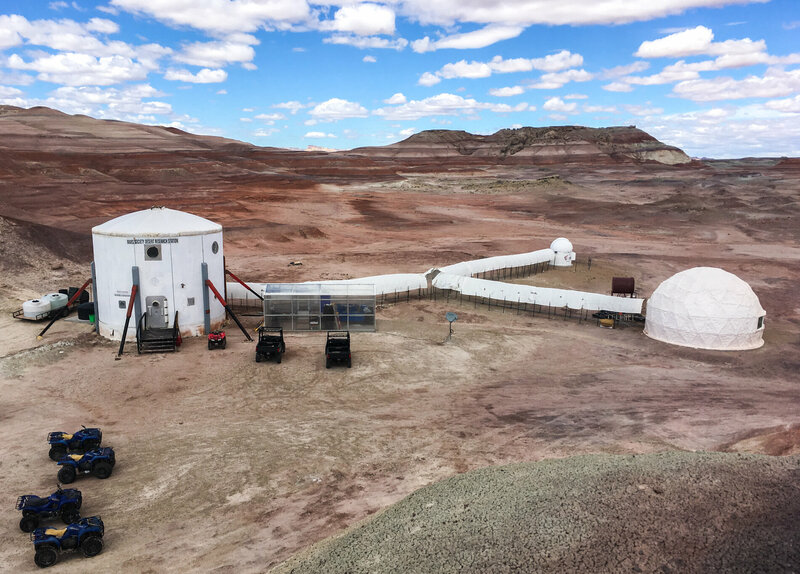 For 16 years, this facility surrounded by red hills, deep canyons and very few signs of life has been a kind of testing ground for learning what life on the Red Planet might be like. Some think of Mars as the next frontier for human exploration; in March, President Trump signed a bill reiterating NASA&apos;s plan to send people to orbit Mars in the 2030s, with a goal of studying the possibility of "living off the land" there. Some view Mars as a necessary Plan B — a place to go if, or when, Earth is no longer habitable. Others view getting there as a milestone in a mission to make humans an interplanetary species. 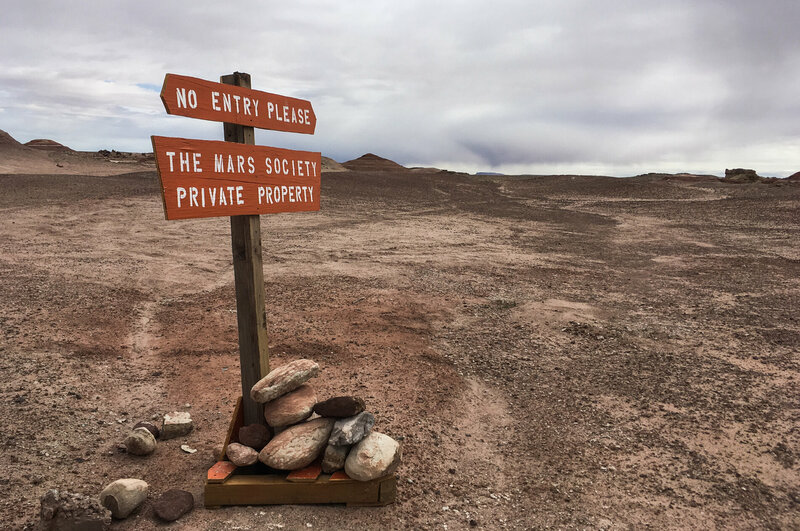 Some combination of the above prompted the Mars Society — a nonprofit funded by grants, private donations, membership fees and, in the past, by donations from the Musk Foundation — to start this site in Utah in 2001. The Mars Society and its research station aren&apos;t affiliated with NASA, which has its own simulation site in Hawaii. Missions last as long as 12 months there. And the crews, composed of top professional scientists and engineers, perform tasks in the NASA simulations that are very close to the agency&apos;s expectations for Mars exploration. 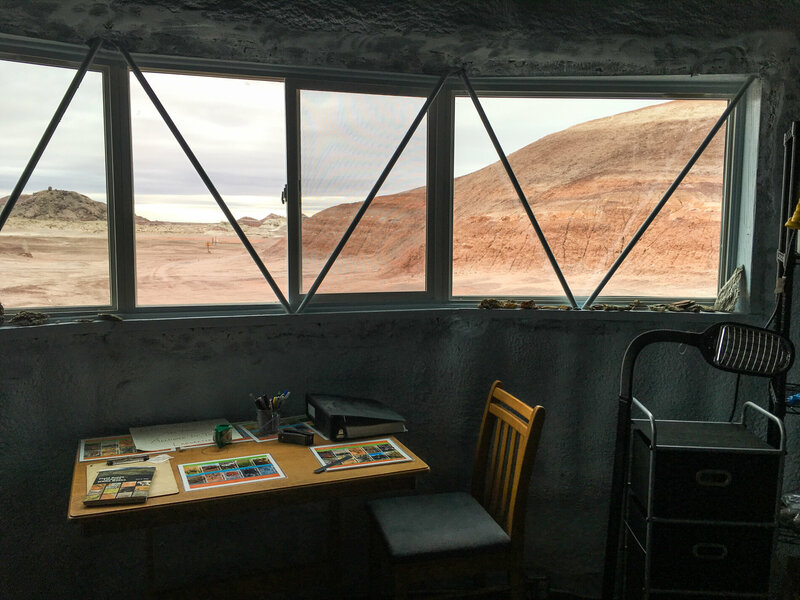 In contrast, missions at the Mars Society&apos;s Utah site tend to last two to three weeks. Volunteer crews, which are often sponsored by universities and occasionally companies — Ikea recently sponsored a group of the firm&apos;s furniture designers — cycle through from October to May on simulated missions of their own design. The sponsoring institutions pay the Mars Society between $300 and $550 per participant per week. Applicants propose Mars-specific scientific projects that they hope the society will judge, according to its guidelines, to be useful in "promoting the human settlement of the planet Mars." Each simulated mission requires its crew members to live in isolation in a harsh environment where water and energy must be carefully budgeted and storms can knock out communication with Capsule Communications — their only connection to the outside world. A sticker on the hatch to the capsule that serves as the crew&apos;s home reads, "Whatever it takes." Most teams that come here are made up of scientists from around the world. Crew 176 came from Poland, and Crew 178 from Belgium. Crew 177 is a little different. Six members are students at McLennan Community College in Waco, Texas. Their astronaut credentials include robotics clubs, Boy Scouts and high school chemistry. Some students are the first in their families to go to college; at least one had never been to a state other than Texas before taking part in this simulated Mars mission. Their projects include testing soil samples for microbial life, using a stationary bike to charge batteries and testing a miniature prototype of an emergency response rover. On the day I visited, part of the group went on a simulated spacewalk, which they called an "EVA" — extravehicular activity. Their goal was to survey the area for signs of water and geologic history and collect rock samples, which they would later test for things like iron, potassium and uranium. 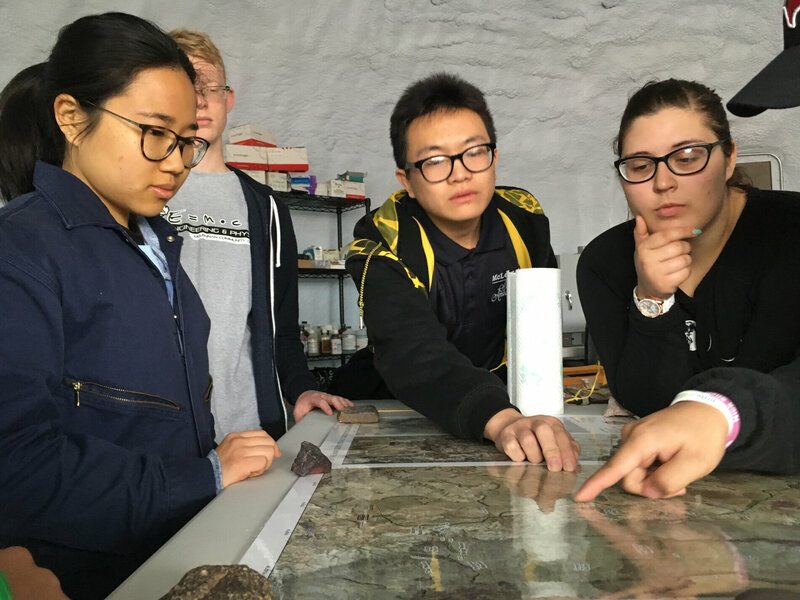 "We want to find what&apos;s available on Mars and utilize it, instead of bringing supplies from Earth," said Pitchayapa Jingjit, Crew 177&apos;s designated biologist and photographer. Jingjit is entering her second year at McLennan. "It also gives us a glimpse of what was once here in the past," added Esteban Ramirez, the crew gardener and astronomer, who is studying biomedical engineering. 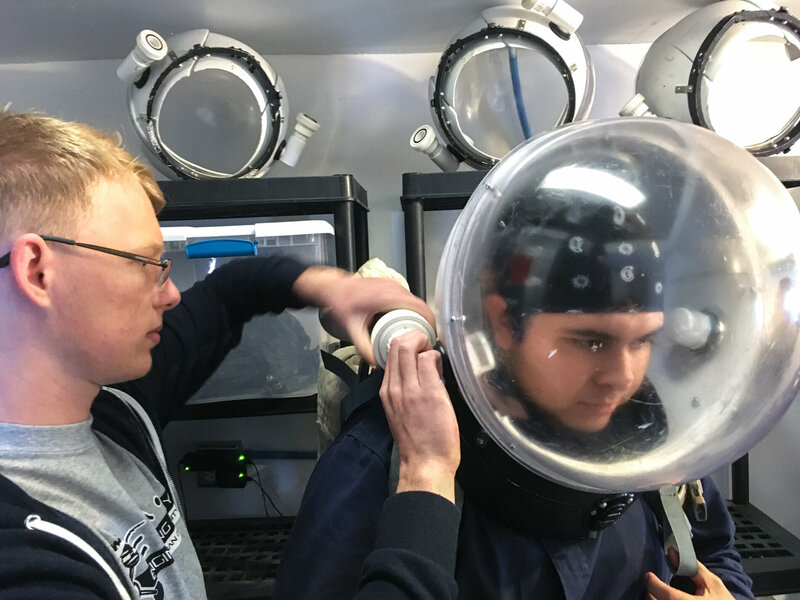 Jingjit, Ramirez and two other team members stepped into cloth bodysuits, clicking their spherical plastic helmets in place and putting on gloves and shin guards (to shield them from notably non-Martian threats, such as rattlesnakes). "Good luck. Be safe," Otsmar Villarroel advised them from the other side of the door. He&apos;s a professor of chemistry at McLennan, but for Crew 177, he is "Commander V."
The four suited-up explorers opened the hatch to another small room, dubbed the airlock. The airlock&apos;s wall was decorated with a flag made of three vertical rectangles in red, green and blue. "I guess when we land on Mars, that&apos;s what&apos;s gonna be planted," said Espinoza, pointing out the popular but unofficial flag. It&apos;s meant to represent the theoretical transformation of Mars from a hostile, red environment to a livable, Earth-like planet of green and blue. The four team members squeezed into the airlock and counted down 60 seconds. They were simulating depressurization, a process that would be necessary on Mars to keep people from get sucked out into the low-pressure atmosphere — like ants yanked up a vacuum cleaner — as soon as they cracked open a door. Then the explorers stepped out onto the surface of simulated Mars-in-Utah, boarded a couple of ATVs, and used GPS to navigate their way to a pre-determined rock outcropping, zooming between hills with stripes of maroon, white, red and yellow. The landscape looked ancient. When they stepped off their vehicles to collect a sample, the ground crumbled underfoot like stale muffins. "These are all ancient sand dunes," said Espinoza, before hammering off a chunk of sandstone and sealing it in a plastic baggie. "There used to be an ocean where we&apos;re standing." The students all had different backgrounds and reasons for coming here. What united them is a college class called Mars 101 and a belief that it&apos;s necessary for humans to set foot on the planet. Actually traveling to Mars is "something that I feel like we have to do as a human race," said Espinoza, who is studying mechanical engineering. "Four or five generations down the road, there may be a point in time where Earth isn&apos;t suitable anymore. You have to leave. And it&apos;s either the human race can end, or the human race can progress on another planet." LaBarre, who has been to MDRS twice and is Crew 177&apos;s executive officer and chemist, said she is excited about the technological advances that will come in the process of readying humans for life on Mars. "Oh man, it&apos;s going to be amazing," she said. She views her time at the MDRS as the ultimate test of her robotics skills. It takes creativity in tight situations to succeed on Mars, said LaBarre, who is so enthusiastic about the Utah experience that she routinely refers to the site as "Mars." When her prototype rover broke, LaBarre soldered together two cellphone chargers to get it going again. "I think that&apos;s why I ended up coming to Mars and falling in love with Mars," she said. "There&apos;s not a single person out there who can go, &apos;Victoria, you can&apos;t be an engineer.&apos; It&apos;s like, &apos;Really? Watch me.&apos; "
"There&apos;s so much that we can gain as a people," Ramirez said of the simulated mission, "and I really want to be a part of that, even if it&apos;s just staying in a little tin can for a week. Anything I can do to help." The group made a taco dinner that night from dehydrated ingredients so dry they rattled in the containers. They sent a report of the day&apos;s accomplishments to Cap Comm, mentioning that everyone was doing well but the toilet was malfunctioning, and that worried them — just as it might on Mars. They watched the sunset from the capsule&apos;s portholes, and spotted crystals of gypsum on the hills, which LaBarre said "glitter like diamonds." And then, after a few days, they stepped out of the capsule again — this time not wearing spacesuits — and went back to breathing the outside air. They traveled back to Waco, to classes and homework and dreams of graduate school. If all goes as planned, by the time the members of this crew are in their late 30s, NASA will have sent humans to the Red Planet. The real one.